Previewed at: Roadshow Theatrette, Pyrmont, Sydney, on 2 August 2107. From the prodigious Doug Liman (one of the co-producers of The Bourne Identity franchise and director of the soon-to-be-released Tom Cruise vehicle American Made) comes The Wall, an intense, in-your-face, close-up of a day in a war zone. Set in the Iraqi desert towards the end of 2007, a couple of US servicemen are holed up on an incline observing the carnage in the distance. They can see a group of contractors lying in the dust, all expertly shot through the head from afar. 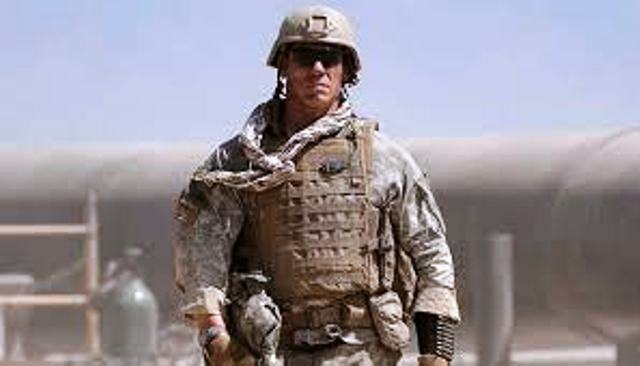 Figuring they are witness to a sniper’s evil handiwork, the soldiers have been on a long, 20-hour plus stakeout when one of them, Matthews (John Cena), loses patience and decides to go and check out the scene for himself. On arriving, a shot rings out and he is left lying on the ground in agony. It turns out that Isaac (Aaron Taylor-Johnson) and Matthews are themselves a sniper team, one being the ‘eyes’ and the other the ‘shooter.’ They’re seasoned combatants but one of them is not looking forward to returning to life back in the States because of something that happened during his tour of duty. When Isaac attempts to go to the aid of his wounded mate, he too is shot at and he takes refuge behind a crumbling wall, all that remains of a village school. When the GI radios for back-up the line is intercepted, whereupon he begins a torturous conversation with Juba (Laith Nakli), an Iraqi sniper called ‘the Angel of Death,’ who’s notorious for his unerring accuracy and high body count. And so begins a terrifying mental game of cat and mouse.